Pulaski County USA’s central location, winding country roads, storied Route 66 pavement, and community support for those who ride make us a welcoming destination for our two wheeled and three wheeled friends. For a calendar of rallies, runs, and rides log on to http://www.PulaskiCountyUSA.com. Experience the open road in Pulaski County USA! Show your Earth Day appreciation with your family by exploring Pulaski County USA’s scenic beauty while searching for more than forty geocaches. Kick off your treasure hunt at Waynesville Community Park April 20th. Commander of the Military Order of the Purple Heart, Department of Missouri, Everett Kelly made his third trip to Pulaski County in as many months on March 25, 2013 to present Pulaski County Commissioners with a plaque and flag recognizing the county as a Purple Heart County. Pulaski County is the first county in Missouri to receive this designation, joining in the states effort to honor those veterans who have been wounded or killed while in military service to our country. The declaration follows legislative action which made Missouri’s entire sections of Interstate 44 and 70 a Purple Heart Trail. Commander Kelly, a two-time Purple Heart recipient, along with other Purple Heart recipients, a color guard, and Presiding Pulaski County Commissioner Gene Newkirk raised the County’s Purple Heart flag above the courthouse. The City of Waynesville joined sister city, Saint Robert, as a Purple Heart City on March 21, 2013. 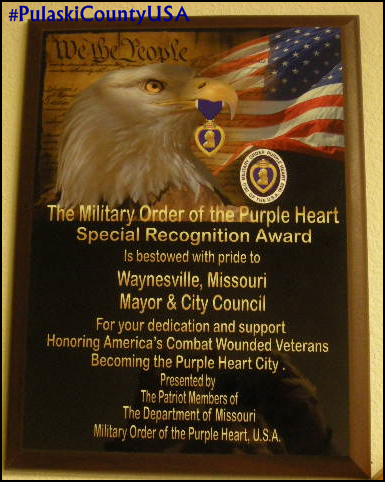 Waynesville is now part of the Purple Heart Trail along Interstate 44. The City of Saint Robert became the first city on the Interstate 44 corridor to become a Purple Heart City on the Purple Heart Trail January 7, 2013. Waynesville is the fifth city in Missouri to receive the Purple Heart City designation, joining in the states effort to honor those veterans who have been wounded or killed while in military service to our country. The declaration follows legislative action which made Missouri’s entire sections of Interstate 44 and 70 a Purple Heart Trail. Commander Everett Kelley, of Buffalo, and long-time Waynesville resident, SGM (Retired) Edgar Irizarry presented a flag and plaque to the City making that designation. Mayor Luge Hardman stated that the City is “honored to be included in this designation, as we honor the service of our valiant military.” The City of Waynesville will proudly fly the Purple Heart flag on special days. 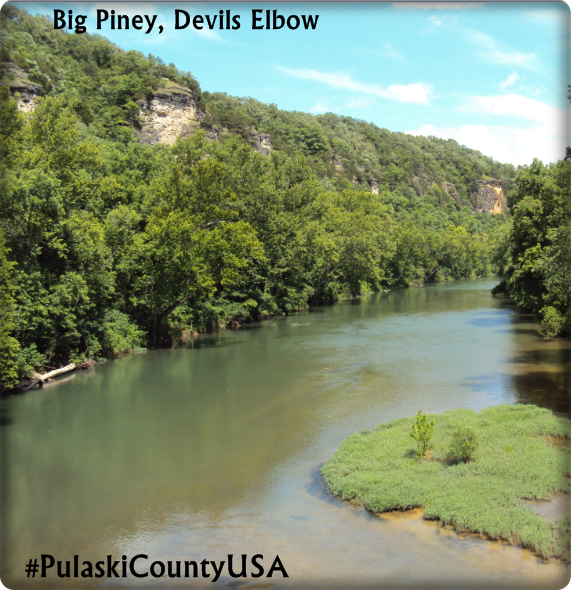 The Pulaski County Outfitter Association welcomes you to the rivers and streams of Pulaski County. 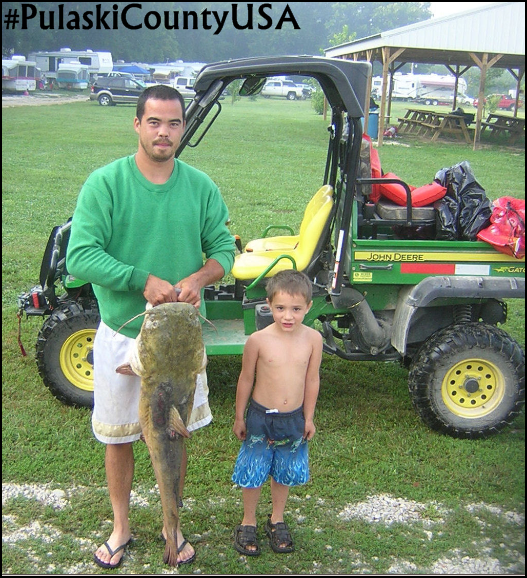 We are blessed here to have some of the best recreational outdoor opportunities found in the Missouri Ozarks. Pulaski County has a great river heritage where generations of families have enjoyed swimming, camping, floating and fishing along our many rivers and streams. I know you will be excited to see our towering limestone bluffs and the pristine scenery found along the Big Piney and Gasconade Rivers. Our floatable streams are spring-fed and offer year round opportunities for you and your family to see nature at its best. Our rivers and streams are served by our association member outfitters who offer great camping, fishing, canoeing, kayaking, rafting, tubing, cabin and lodge rentals opportunities. A float trip on the Big Piney or Gasconade River is a great way to relax and to see the wonder of the Missouri Ozarks. Our association members encourage you to let us help you plan your next outdoor adventure. We are here to serve you and look to earn your business while you are here in Pulaski County. As you discover the majesty of all there is to do here please take time to connect – or reconnect with the outdoors; our float streams have much to offer. What: Benefit dinner & concert featuring Kricket Alley and special guest, Chelsey Jones. Proceeds to go to Pulaski County Humane Society and Waynesville Shelter. Follow #PulaskiCountyUSA on our social media channels!